Napoleon was an angry little man. This is common knowledge. It is written: Napoleon was short and insecure. Psychology even names a type of inferiority complex after the little general. But like so many things in this darkling world, there is little veracity to this tidbit of common knowledge. 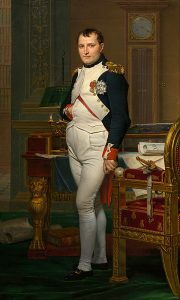 Point of fact: Napoleon was five-six, which is only three inches shorter than the average American male. (Look it up in Wikipedia if you don’t believe me.) Having become a general at the age of 24, he did not likely suffer feelings of inferiority and by all accounts was possessed of great confidence and authority. Whatever Napoleon lacked in an imposing physical stature was more than compensated by an extraordinary will. Some said he had an almost hypnotic effect on those around him. Most of this Napoleon achieved through sheer force of will, through focus and diligence, with discipline and great effort. He was at times, however, aided by the ingestion of what many would consider a magic potion but what was in fact just some of the best brandy ever created. It is, of course, magical brandy, but it’s not magical because some sorcerer babbled bits of arcane gibberish while waving his hands frantically about. Napoleon’s Brandy acquired its magical properties through the process of imbuement. The drink was made specially for the general, and he always kept a flask of it near his heart. Over time the flask and the brandy became imbued with the essence of courage, particularly courage in the face of deadly enemies, immortal foes, and supernatural entities. (You didn’t know Napoleon did battle with supernatural entities? Well, you’ve got a lot to learn.) Next to Thor’s Hammer or the Lion Cloak of Heracles, Napoleon’s Brandy (which consists of both flask and drink) is the best-thing to have on you when facing down otherworldly nasties. Since it’s lighter and fits in a pocket, I prefer it over the other items. That it contains brandy doesn’t hurt also. To use the stuff, you have to do a bit more than simply take a sip. There’s an incantation involved. Raise it to your lips without whispering the passphrase and the flask turns up empty. The incantation is in French, of course. So the pronunciation and accent must be impeccable. Raise the flask, concentrate, whisper J’aurais dû mourir à Waterloo, and drink. The effects are immediate. ← Wednesday Morning 3 A.M.